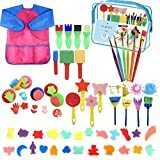 [Perfect kids gifts]:52 Pcs Sponge Painting Brushes for helping kids early development in their drawing, arts, socialization imagination and creativity. [Soft and healthy material]: All brush handle is made of non-toxic and safe high quality EVA plastic. And the brush head is made from water absorption foam and sponge. It is soft, comfortable, reusable and easy to clean and dry. [Help children to learn]: To draw or DIY with the kit, can inspire children's imagination and creativity. From small painting exercises can also help children strengthen the hand muscles and developing fine motor skills. [kids painting brush]: They are also designed in comfortable sizes for the little artists age 2-6 years old to navigate and explore the different patterns and shapes they can create with the tools. Additional waterproof apron can protect the child's clothes from being dirty. 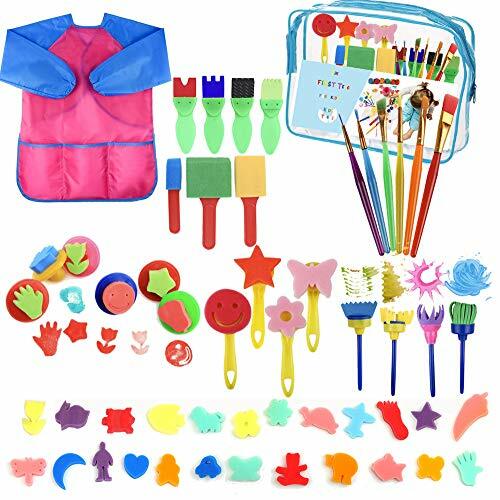 Package Included:52 pcs sponge painting brushes and 1 pc waterproof kids art apron (18-Month warranty and best customer service.Please feel free to contact us if you have any question. With these different painting kit, the kids can unleash their creativity and imagination. The little artists can create more patterns, shapes and depth to their masterpiece. Easy to wash and dry. They are designed in comfortable sizes for little ones aged 2-6 years old to hold and navigate. Please use it under adult's supervision, do not put the brush into the mouth.